C. Kanzow, D.H. Li and N. Yamashita, Numerical Algebra, Control and Optimization, Vol.1, No.1, 2011. 1. D.H. Li, J.P. Zeng and S.Z. Zhou, Convergence of Broyden-like matrix, Applied Mathematics Letters, 11 (1998), no. 5, 35--37. 2. D.H. Li and J.P. Zeng A penalty technique for nonlinear complementarity problems, Journal of Computational Mathematics, 16 (1998), no. 1, 40--50. 3. D.H. Li and M. Fukushima, A globally and superlinearly convergent Gauss-Newton based BFGS method for symmetric nonlinear equations, SIAM Journal on Numerical Analysis, 37 (1999), no. 1, 152-172. 4. D.H. Li and M. Fukushima, A derivative-free line search and DFP method for symmetric equations with global and superlinear convergence. Numerical Functional Analysis and Optimization, 20 (1999), no. 1-2, 59--77. 5. D.H. Li and M. Fukushima, A derivative-free line search and global convergence of Broyden-like method for nonlinear equations, Optimization Methods and Software, 13 (2000), No. 3, 181-201. 6. D.H. Li and M. Fukushima, Smoothing Newton and quasi-Newton methods for mixed complementarity problems, Computational Optimization and Applications, 17 (2000), 203-230. 7. Y. Yang and D.H. Li, Broyden's method for solving variational inequalities with global and superlinear convergence, Journal of Computational Mathematics, 18 (2000), no. 3, 289--304. 8.D.H. Li, L. Qi, A stabilized SQP method via linear equations, Department of Applied Matheamtics, School of Mathematics, New South Wales University, Sydney, Australia, 2000. 2001年9. 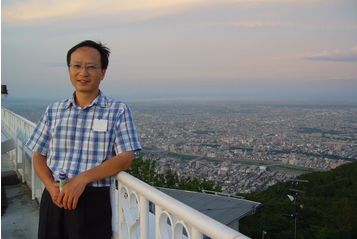 D.H. Li and M. Fukushima, On the global convergence of BFGS method for nonconvex unconstrained optimization problems, SIAM Journal on Optimization, 11 (2001), 1054 - 1064. 10. D.H. Li and M. Fukushima, Globally convergent Broyden-like methods for semismooth equations and applications to VIP, NCP and MCP, Annals of Operations Research, 103 (2001), 71 – 79. 13. Y. Yang and D.H. Li, A trust region algorithm for constrained nonsmooth optimization problems, Journal of Computational Mathematics, 19 (2001), No.4, 357-364. 14. D.H. Li and M. Fukushima, A modified BFGS method and its global convergence in nonconvex minimization, Journal of Computational and Applied Mathematics, 129 (2001), 15-35. 15. X. Tong and D.H. Li, L. Qi, An iterative method for solving semismooth equations, Journal of Computational and Applied Mathematics, 146 (2002), 1-10. 16. G. Gu, D.H. Li, L. Qi and S. Zhou, Descent directions of quasi-Newton methods for symmetric nonlinear equations, SIAM Journal on Numerical Analysis, 40 (2003), 1763 - 1774. 17. Y. Jiang, D.H. Li and J.P. Zeng, Weighted max-norm estimate of additive Schwarz methods for solving nonlinear complementarity problems，Optimization Methods and Software, 18 (2003), 657-672. 19. L. Qi, X. Tong, and D.H. Li, An active-set projected trust region algorithm for box constrained nonsmooth equations, Journal of Optimization Theory and Applications, 120, (2004), No. 3, 601 – 625. 20. D.H. Li, L. Qi, J. Tam and S. Wu, A smoothing Newton method for semi-infinite programming, Journal of Global Optimization, 30 （2004）, No. 2-3, 169-194. 21. D.H. Li, M. Fukushima, L. Qi and N. Yamashita, Regularized Newton methods for convex minimization problems with singular solutions, Computational Optimization and Applications, 28 (2004), No.2, 131-147. 22. S. Wu, D.H. Li, L. Qi and G. Zhou, An iterative method for solving KKT system of the semi-infinite programming, Optimization Methods and Software, 20 (2005),629-643. 24. L. Zhang, W. Zhou and D.H. Li, A descent modified Polak-Ribiere-Polyak conjugate gradient method and its global convergence， IMA Journal of Numerical Analysis, 26 (2006), 629-640. 2007年24. J. Zhang and D.H. Li，A norm descent BFGS method for solving KKT systems of symmetric variational inequality problems, Optimization Methods and Software, 22 (2007)，237-252. 25. Y. Zhou and D.H. Li, Coordinating order quantity decisions in the supply chain contract under random demand，Applied Mathematical Modelling， 31 (2007)， 1029-1038. 27. T. Liu and D.H. Li, A cautious BFGS update for reduced Hessian SQP, Numerical Algorithms, 44 (2007), 11-28. 28. T. Liu and D.H. Li，Convergence of the BFGS method for degenerate problems, Numerical Functional Analysis and Applications, 28 (2007), 927-944. 29. T. Liu and D.H. Li, A practical update criterion for SQP method，Optimization Methods and Software, 22 (2007), 253-266. 30. L. Zhang, W. Zhou and D.H. Li, Global convergence of the DY conjugate gradient method with Armijo line search for unconstrained optimization problems. Optimization Methods and Software, 22 (2007), 511-517. 31. L. Zhang, W. Zhou and D.H. Li, Some descent three-term conjugate gradient methods and their global convergence, Optimization Methods and Software, 22 (2007), 697-711. 32. D.H. Li and W. Cheng, Recent progress in the global convergence of quasi Newton methods for nonlinear equations, Hokkaido Journal of Mathematics, 36 (2007), No.4，729-743. 33. W. Zhou and D.H. Li., A globally convergent BFGS method for nonlinear monotone equations, Mathematics of Computation, 77 (2008), No. 264, 2231 - 2240. 34. D.H. Li, Y.Y. Nie and J.P. Zeng, Conjugate Gradient Method for the Linear Complementarity Problem with S-Matrix, Mathematical and Computer Modelling, 48 (2008), No.5-6, 918–928. 35. Y. Xiao and D.H. Li, An active set limited memory BFGS algorithm for large-scale bound constrained optimization, Mathematics Methods and Operations Research, 67 (2008), No.3, 443-454. 35. D.H. Li, L. Qi and V. Roshchina, A New Class of Quasi-Newton Updating Formulas, Optimization Methods and Software, 23 (2008), No.2, 237-249. 36. G. Luo and D.H. Li, Robust Optimization Equilibrium with Deviation Measures, Jacific Journal of Optimization, 5 (2009), No.3, 427-441. 37. Y. Li and D.H. Li, Truncated regularized Newton method for convex minimization, Computational Optimization and Application, 43 (2009), No.1,119-131. 2010年39.pdf39. Z. Sun, J.P. Zeng and D.H. Li, Semismooth Newton Schwarz iterative methods for the linear complementarity problem, BIT Numerical Mathematics, 50 (2010), No.2, 425-449. 40. F. Wang, D.H. Li and L. Qi, Global convergence of Gauss-Newton-MBFGS method for solving the nonlinear least squares problem, AMO - Advanced Modeling and Optimization, 12 (2010), No.1 1-19. 41. Q. Yan, X.Z. Peng, D.H. Li A globally convergent derivative-free method for solving large-scale nonlinear monotone equations, Journal of Computational and Applied Mathematics, 234 (2010), No.3, 649-657.42. W.Cheng and D.H. Li, Spectral scaling BFGS method, Journal of Optimization Theory and Applications, 146 (2010), No.2, 305 - 319. 43. Q. Li, D.H. Li and Houduo Qi, Newton’s method for computing the nearest correlation matrix with a simple upper bound, Journal of Optimization Theory and Applications, 147 (2010), 546–568. 44. Q. Li and D.H. Li, A new smoothing function and a smoothing Newton method for nonlinear complementarity problems, AMO - Advanced Modeling and Optimization, 13 (2011), No.2, 141-152. 45. Q. Li and D.H. Li, A projected semismooth Newton method for problems of calibrating least squares covariance matrix, Operations Research Letters, 39 (2011) 103–108. 46. X. An and D.H. Li, Sufficient descent directions in unconstrained optimization, Computational Optimization and Application, 48 (2011), 515-532. 47. D.H. Li and B. Tian, n-step quadratic convergence of the MPRP method with a restart strategy, Journal of Computational and Applied Mathematics, 235 (2011), No.17, 4978-4990. 48. D.H. Li and X.L. Wang, A modified Fletcher-Reeves-type derivative-free method for symmetric nonlinear equations, Numerical Algebra, Control and Optimization, 1 (2011), 71-82. 50. Q. Li and D.H. Li*, A class of derivative-free methods for large-scale nonlinear monotone equations, IMA Journal of Numerical Analysis, 31 (2011) , 1625−1635 . 51. M. Li and D.H. Li, A modified conjugate-descent method and its global convergence, Pacific Journal of Optimization, 8 (2012), 247-259. 52. A. Qu, D.H. Li and M. LI, The convergence rate of a restart MFR conjugate gradient method with inexact line search, Applied Mathematics and Computation, 218 (2012), 11380 – 11390. 53. Yu, D.H. Li and N. Dong, Convergence of the cyclic reduction algorithm for a class of weakly overdamped quadratics, Journal of Computational Mathematics, Vol.30, No.2, 2012, 139–156. 54. W. Cheng and D.H. Li, An active set modified Polak–Ribiére–Polyak method for large-scale nonlinear bound constrained optimization, Journal of Optimization Theory and Applications, 155 (2012), 1084–1094. 55. Z. Dai, D.H. Li and F. Wen, Robust conditional value-at risk optimization for asymmetrically distributed asset returns, Pacific Journal of Optimization, 8 (2012), 429-445 . 56. .H. Li, Q. Li and H. Xu, An almost smooth equation reformulation to the nonlinear complementarity problem and Newton's method, Optimization Methods and Software, 27 (2012), 969-981. 57. Y. Li, S. Zhu, D.H. Li and D. Li, Active allocation of systematic risk and control of risk sensitivity in portfolio optimization, European Journal of Operational Research, 228 (2013) 556–570. 58. Y.H. Xiao, S. Wu and D.H. Li, Splitting and linearizing augmented Lagrangian algorithm for subspace recovery from corrupted observations, Advance in Computational Mathematics, 38 (2013), No. 4 38:837–858. 60. W. Cheng, Z. Chen and D.H. Li, An active set truncated Newton method for large-scalebound constrained optimization, Computers and Mathematics with Applications,67 (2014) 1016–1023. Journal ofIndustrial and Management Optimization, 10 (2014), 905-927. 62. W. Cheng, Q. Liu and D.H. Li, An accurate active set conjugate gradientalgorithm with project search for bound constrained optimization, Optimization Letters, 8 (2014),763-776. 63. D. Li, L. Wu, Z. Sun and X. Zhang A constrainedoptimization reformulation and a feasible descent direction method for L1/2 regularization,Computational Optimization andApplications, 59 (2014), 263-284. Pacific Journal of Optimization, 10 (2014), 401-414. 65. W. Zhou and D.H. Li, On theconvergence properties of the unmodified PRP method with a non-descent linesearch,Optimization Methods &Software, 29 (2014), No. 3, 484–496. 69. H. Wang, DH Li, X.J. Zhang, L Wu，Optimality conditions for the constrained Lp -regularization, Optimization, 2015. 70. F. Wu and D.H. Li, The restricted isometryproperty for signal recovery with coherent tight frames, Bulletin of theAustralian Mathematical Society, 92 (2015), No. 3, 496-507. L1/2 regularized problem, Journal ofScientific Computing, May 67 (2016), No. 2, 581–601. Optimization Methods & Software, 31 (2016), No. 4, 775–790.